Just thinking about mercy and thought, "Why not post on my blog?" It's been a while. Almost a year. I'm still here though!! Those who are merciful will receive mercy in return. Those who are not merciful will be judged by the Lord without mercy; he is merciful and expects us to be like him. Mercy is one of the gifts mentioned in Romans 12 - and we are supposed to show it with cheerfulness. Love the Lord your God with all your heart, soul, mind, and strength, and love your neighbor as yourself. This is nothing new; God has always required this of man, and Christ confirms it: "Do this and you will live." Simple. Or is it? Well, it is if your heart is right!!! But, the lawyer's heart was not right. He was trying to justify himself or find some way out or something. His response, "Who is my neighbor?" proves it. So, who is our neighbor? Christ gives us a very clear example: our neighbors are not just those people we know and care for, they are even strangers and/or enemies. Christ asks the lawyer point blank: "Which of these 3 men do you think was a neighbor to the stranger?" The priest and the Levite left him in the ditch to die. These men who are supposed to be examples of God and fulfilling God's work here on earth were actually just hypocrites. I'm guessing their followers did not see this though. The Samaritan - a supposed enemy - came by, saw him, cleaned him up, took him to shelter, stayed with him all night, paid the keeper in advance the amount he thought would cover it, but then said he'd pay anything lacking upon his return. So who was the true neighbor to the stranger? The lawyer responded, "HE WHO SHOWED MERCY ON HIM." You can't hide from that truth. It's right there for all to see ... even the lawyer saw it and had no way around it. Christ returned, "YES - GO AND DO THE SAME." There you have it. The key to eternal life: be merciful even as our Father in heaven is merciful. This is nothing you can fake or manufacture. It comes straight out of a pure heart that loves the Lord and wants to do what pleases him. 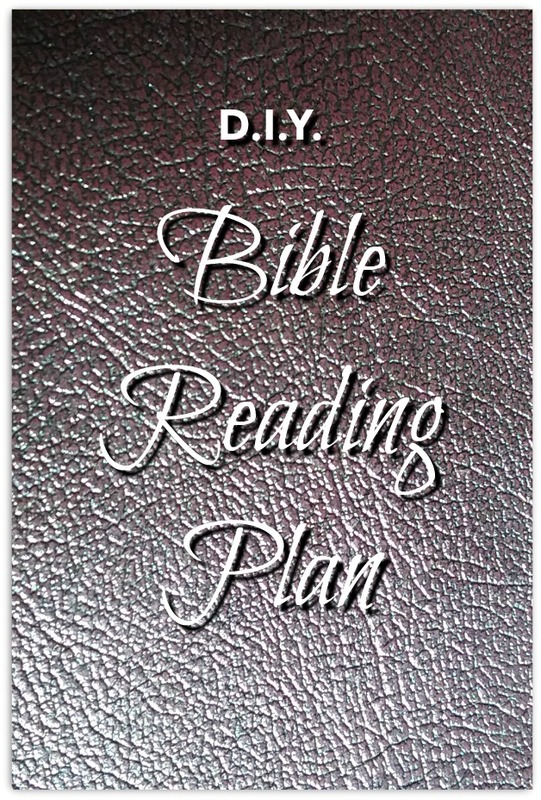 I've tried many bible reading plans over the years, but eventually became somewhat frustrated with them all. 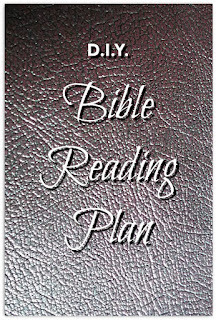 I began with the "read the bible in one year" plan, and then I tried out the "chronological bible in a year" plan. At some point I learned about reading 7 chapters of the New Testament each day to get through the NT in less than 2 months. I did that with the children for a few years when I first started following the Lord, and it was such a nice way to learn! At that same time I would read 11 chapters of the Old Testament each day and get through that in less than 3 months. There were other plans in there, too, however like I said, all of the methods somewhat frustrated me. Why? Simple. Some chapters are really long and some chapters are really short!! The time spent reading was unpredictable. It's hard to schedule "unpredictable". At some point it occurred to me that I did not have to follow someone else's plan or method; I could make up my own. Dah. This method has served me quite well for the last several years. Here it is. Determine the total number of pages in your bible. Some bibles start counting over when the NT begins. Some bibles include title pages, table of contents, blank pages, and more, in their numbering. Be sure to account for these things. The bible I read daily has 1,231 actual pages of text. Decide how long you want to take to get through the entire bible. During busy seasons you may plan for less time reading; during slow seasons you may plan for more time reading. The most important thing, as always, is to LIVE what you read! Some days you might even have to skip reading ... that's perfectly fine as long as you are LIVING it. If you are not going to live it out, you might as well throw it in the trash and spend your time doing something else. For the sake of this article, I'll give the examples of 1 year, 6 months, 3 months and 2 months. Figure out how many days are in the time you chose. Round up or down in a way that makes sense to you. 2 months x 30.5 days = 61 days. Divide the total number of pages by the total number of days. Again, round up or down in a way that makes sense to you. That's it. So simple, right? In this next section I'd like to share some of my most favorite tools. I'm doing something new on this blog ... I will include links to Amazon that are 'affiliate links' (SEE THE BOTTOM OF THIS POST!). If you click on the link and actually buy something, I will get a tiny monetary tip from Amazon. The products cost the same to you either way. Some of the links I share here will be Amazon affiliate links. Number one of course: a bible. This is definitely a personal thing, but for **ME** I like to have wide margins with plenty of room to take notes. 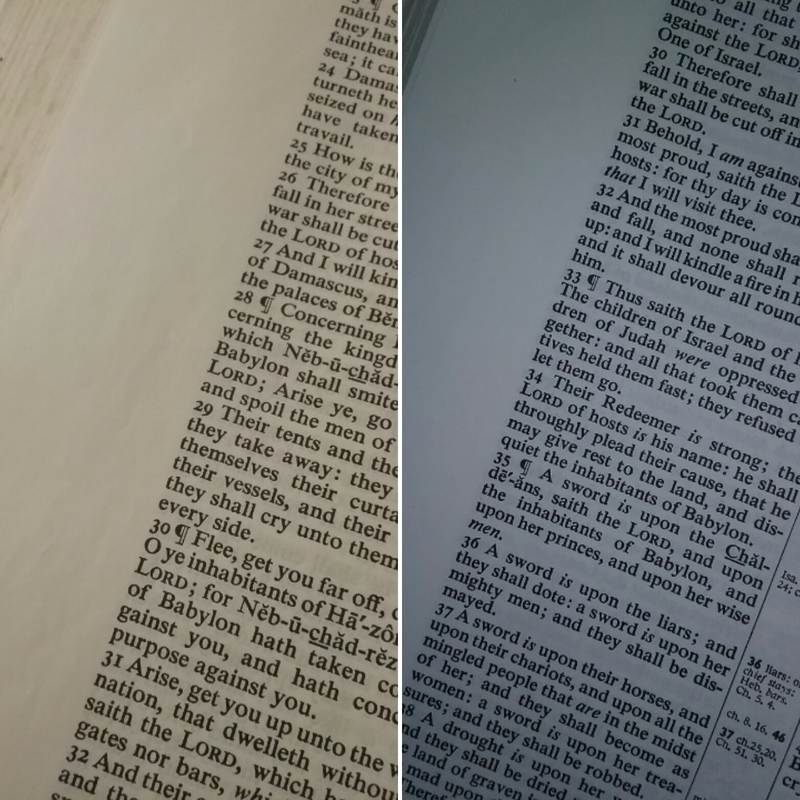 The bible I used has just that: wide margins. But what's even better is it has a lot of lined paper in the back for note-taking. If something needs more room than the wide margin provides, I just write the "note number" in the margin, and then I know there are notes in the back for that particular verse or passage. 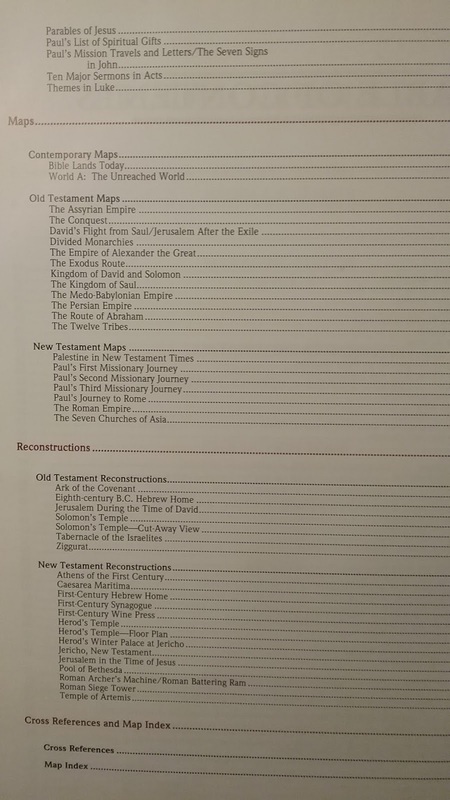 My bible also has references in the middle column. I cannot speak positive or negative about these references because I ignore them. In the back there are several really nice maps, a concordance, and blank pages with a letter at the top of each page, going through the whole alphabet. 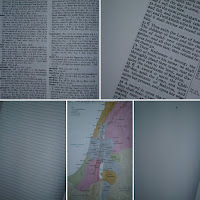 I have included a photo collage of all I mentioned here ... however the photos kind of came out 'blue', and one thing I REALLY LIKE about this bible is that instead of the pages being bright white, they are a soft, creamy, off-white. 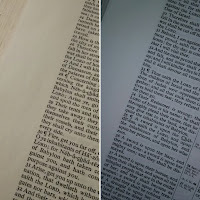 The second photo shows the same bible in different lighting, side-by-side. A strange study tool maybe? but I love it!!! This table fits in my chair, and my little chihuahua fits right underneath it on my lap. You may prefer to have other colors besides black ... maybe you like to color-code your notes? Different colors for different topics? I find this distracting, but you might not? Whatever your preference, the Pigma Micron is excellent, and comes in a variety of colors and tips sizes. This one is free. I use an old credit card to help make straight lines in my bible. Crooked lines look sloppy to me and are distracting. Straight lines are nice. Very nice. 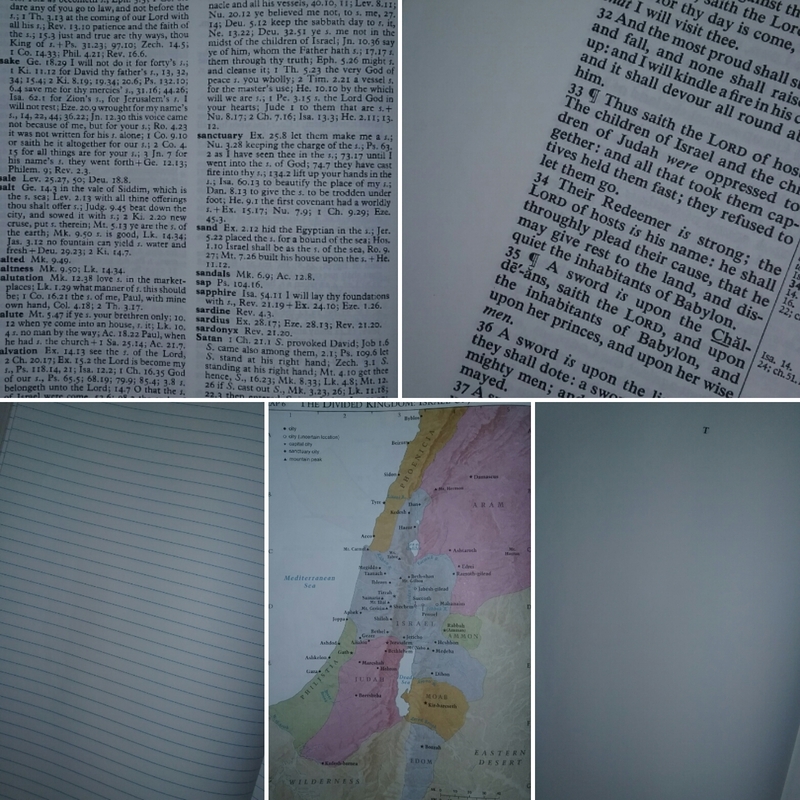 I keep the "Holman Book of Biblical Charts, Maps, and Reconstructions" with my bible. This book has come in handy so many times!!! I'll include photos of the table of contents so you have a general idea of what it includes, however it will not do it justice. One thing I love is the information on biblical weights, money, measurements, etc. For instance, when the bible talks about an "hin" of oil, instead of just reading past it and not knowing, I stop, open up my handy book, and learn that an "hin" of oil is one gallon. I then write this next to the verse that talks about the "hin". As with any book that claims to be a help, I'm always watching out for potential slants, bias statements, and/or assumptions. For that reason, I keep my reference books slim to none. During seasons when I have time to read more in one sitting, I prefer to listen to the Old Testament on MP3 while reading along. I MUST read along, otherwise I'll start daydreaming. I use an old phone for the MP3 part, and then bluetooth it to a handy little speaker. This thing was pretty inexpensive and it's quite loud. Small and mighty. I like that a full charge will last several hours, and since it's bluetooth, I can use it with any device. I thought, "Who was this man? What is the course of Abia?" etc. So, I opened up the Blue Letter Bible app, found the verse, and clicked on, "Interlinear". From there you are able to click on each word ... I clicked on, "of Abia" G7. It tells you that Abia/Abijah was a priest, the head of a priestly family whom when David divided the priests into 24 classes, Abia was the 8th order. You can see that it was used 3 times in the New Testament, all as the word, "Abia". Twice in Matthew 1:7, and once in the verse above. Side note. Strong's definitions can sometimes be biased or twisted a little, so be careful. Always base the definition on what the bible says, not what Strong's says. In this case, it's a name, so I think we're safe to assume all is well. Now look the same word up in the Old Testament. For this you have to use a Greek Septuagint that's coded with Strong's numbers. I USE THIS WEBSITE. Be sure the 'bible' is set to the Analytical Septuagint with Strong's numbers (which it should be automatically in the link I provided). Put your Strong's number in the search box. In this case, G7. You'll see that Abijah is in the Old Testament 24 times. Some of those will be referring to other men named Abijah, but many of them are referring to Zacharias' kin folk. But, "It's all Greek to me!" For real. 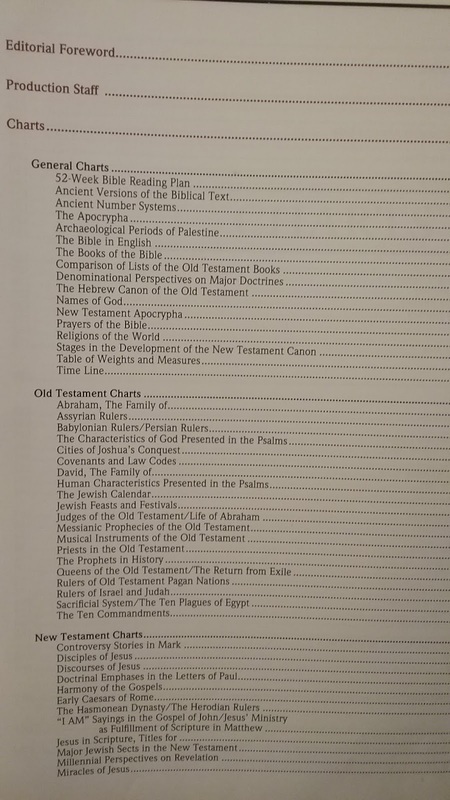 Well, so far the only way I've been able to get around that is to simply write down all of the verses references listed on the website linked above, look them up in my English bible, and read them. Ok, that's all of the bible study tips I have! I pray this was a blessing. "...love covers a multitude of sins..."
No, this is not originally mine, but it does come to my mind quite often, in a variety of circumstances and settings. The depth of this phrase seems endless to me. What all does it mean? What all could it mean? Though I could write on and on about these few simple words, I will only share a few basic thoughts. It seems that when we truly love others (I mean TRULY love others, not the superficial, sappy, emotional, self-centered, circumstance-driven stuff, but the REAL stuff that is spoken of in 1 Corinthians 13, and what all the law and prophets hang on), we are able to overlook any wrong that they might have done to us and just simply be a blessing. Though they may not realize it at the time, if we just keep loving them with godly love, it will leave the doors open for reconciliation ... and isn't that the heart of it all? Reconciliation. On that same train of thought, truly loving and leaving the door open for reconciliation might very well prevent them from further sin. I mean - if you repay evil for evil, hurt for hurt, you are provoking someone to sin even more. That is not love at all. Life [hardly ever, maybe] never happens the way you think or imagine it will. So you might as well save your thoughts, worries, and concerns for the current issue at hand instead of borrowing from tomorrow or next week or next year ... or never. Case in point. I always wondered what it would be like when my daughter was asked for in marriage. Now that it's happened, I can look back and see it didn't go anything like I ever imagined it would. Thankfully I did not waste too much time thinking about it and left it to the Lord. Now a dear brother has become a son-in-law, and my daughter is thoroughly enjoying married life. It's been nearly a month (2 days shy to be exact - feb 19, 2017) and she's learning more and more about this man we've known well and have loved for several years. Just the other day she said to me something like, "Mom, he's so much more than I ever thought!" She is one happy bride ... and he's pretty pleased himself! I'm sure she could write a small book filled with 'what if' or 'I wonder' thoughts about marriage and how it would all go, and pretty much nothing in the book would be true for how it actually went. But thankfully, she too did a really good job of putting those thoughts in their place and spent her years serving the Lord. So, save your precious time God has given you today for whatever is right in front of you, and leave tomorrow where it belongs ... in God's hands. On a side note, getting a little personal here ... I was so blessed to have supper at my daughter's house for the first time a few weeks ago. Sure, I helped her get things ready, and helped clean up, but it was HER kitchen, HER meal, HER home, HER husband ... what a blessing!! I'm so proud of the woman of God she has become, and she just seems to get better and better. Here is a video of the whole ceremony, message, open mic, and singing. Enjoy!! Continuing on in my "Forty Years Series", here is thought number eight ... yes, number eight. I've been busy. I don't think I'll make it to number forty before I turn 41. We'll see. No matter how hard you try, you will not please everyone. People will take your best intentions wrong. Some people will even expect you to be super-human, and fault you when you are not. Maybe you've made mistakes in the past. Haven't we all? Even still, some people will forget that they too have made mistakes, and hold yours against you. So what do you do? As long as you've done your best to seek restitution, just let it go. Focus on pleasing God, not man. And by all means, do not do the same to others!! Allow them to be themselves. So often we are 'let down' or 'disappointed' by someone because they do not meet up to OUR expectations, but really, that's not their fault, it's ours! Love God and love man. It's really just that simple. Be in the moment - especially when it comes to raising your children. Time FLIES. How is it even possible that my oldest child is 23, my girl is 21, and my 'baby' is 19? If I would have truly known how quickly those moments would pass, I would have done a few things differently. So, for those of you who are just starting off or who still have children at home, here is some advice I'd like you to seriously consider. I see so many moms spending way too much time on the internet, on social media, etc. So caught up in what's going on in other places that they miss the moments that are unfolding right in front of them. And for what? I've seen it over and over and over again. Mom is busy looking at her phone. Children get into fights and mom cannot discern what was the cause because she was occupied doing her own thing. Her judgments are not, nor cannot be, just and loving because she was somewhere else instead of where she should have been. Or they find something interesting or exciting ... they want to share but mom only gives them a small part of her attention. They are not stupid! They know when mom is really paying attention! Communication lines are being CUT instead of TIED. They will learn that they are not important enough to deserve mom's undivided attention. And if they do actually get her undivided attention, it only lasts for a few minutes, and then mom is back on your phone again. Maybe mom does not use social media? Maybe she just likes to look up recipes and get organizing ideas? This can divide and rob attention too! She gets online "for just a minute" to "quickly" look up a recipe. An hour goes by and she does not even realize it. Where did the time go and what were her children doing during that gap? I assume my daughter will have a family of her own some day. If her husband believes it's ok to have the internet in the home, I have counseled her to be VERY careful and heavily guard her time. Internet is not bad ... in fact, it can be a blessing and a very useful tool. But we must be very conscious about our use of it. When I finally got a hold of this, I found it easiest to set aside time to use the internet and did not go outside of it. So that is my counsel to my daughter and to you - set aside time that will not interfere with your responsibilities as a wife and mother. I believe it is best to set aside time when your children will be asleep and your husband will not mind. And this is not just about social media!! Another area where I see time being robbed is during meals. More often than not, I see mothers making separate meals for their children, sitting them down to eat, getting their own meal ready, and by the time mom is ready to sit down and eat the children are done. They go off to do their own thing while mom eats (and uses the internet, watches tv, reads, whatever). Mom is a short-order cook, catering to picky eaters. Eat your meals together!!!! Prepare a meal, put the food at the table, have everyone sit down, dish out the food, and eat. Talk to each other!!!! Give each person a turn to share one interesting thing about their day so far. What was one thing they have learned today? Or in what way have they been a blessing to someone else? The topic of possibilities is endless ... but the point is the same: talk! Learn about each other. Meal time is such a great time to bond with everyone in the family, and it can happen AT LEAST three times a day! We always ate breakfast, lunch, supper, and at least one snack together. It wasn't until the boys started working outside of the home that things had to change ... and guess what? I MISS THAT TIME THE MOST! In short, pay very close attention to how you are spending your time when your children are still at home. Be sure you are in the moment. You will not regret it!